Kitchens Are Monkey Business: Mount Rushmore. Keystone, South Dakota. ... until the wind and rain alone shall wear them away. Mount Rushmore. Keystone, South Dakota. ... until the wind and rain alone shall wear them away. Rapid City, SD to Keystone, SD. Mr. Hawthorne and I stayed in Rapid City for the night and Sunday morning, September 26, we took off for Keystone to see Mount Rushmore National Memorial. First, a few words about Keystone, South Dakota. Keystone was established as a mining town soon after William Franklin and his daughter Cora discovered gold. Keystone's gold fever began when Cora Franklin, hiking with her father William, AKA Rocky Mountain Frank, picked up a beautiful rock which turned out to be a gold nugget. Bill Franklin walked the twenty miles to Rapid City in order to file his claim on what was the richest lode in the southern Black Hills. Discovered in 1894, this was the particularly lucrative Holy Terror Gold Mine. After Franklin had celebrated for several days, he returned home to irate wife, Jenny. To soothe Jenny's ruffled feathers, Franklin told his wife the new bonanza mine would bear her name. Thus was born Keystone's Holy Terror Mine, named after the owner's wife, who was disgruntled that the family mines were never named in her honor. Jenny took the joke in stride when the family mine was raking in $70,000 worth of gold weekly. Keystone still celebrates "Holy Terror Day" every year. With its golden reputation established, the township of Keystone became one of the fastest growing boom towns in the Black Hills. Another little note about Keystone: If anyone is familiar with Stewart Edward White's 1901 novels, "The Westerners" and "The Claim Jumpers," they were inspired by Keystone's rugged mining community. Now, on to Mount Rushmore. Approaching Mount Rushmore from the highway. Rosie, once again, is leaning out of the truck snapping away. "... until the wind and rain alone shall wear them away." By the way, the mountain itself was originally named after Charles E. Rushmore, a New York lawyer, who was doing legal work for the Harney Peak Mining Company in the Black Hills. Borglum chose this mountain due to its height, 5700 feet above sea level, the hard grainy consistency of the granite, and the fact that it catches the sun for the greatest part of the day. The presidents were selected on the basis of what each symbolized. George Washington represents the struggle for independence; Thomas Jefferson for the idea of government by the people; Theodore Roosevelt for the 20th century role of America in world affairs; and Abraham Lincoln for his ideas on equality and the permanent union of the states. And there it is - a massive mountain carving featuring the 60 foot tall faces of four American presidents - George Washington, Thomas Jefferson, Theodore Roosevelt, and Abraham Lincoln. Work began on Mount Rushmore in 1927 by 60-year-old sculptor Gutzon Borglum. Work ended 14 years later at Borglum's death. The massive granite sculpture, the largest monument in the world, was accomplished during a time of great national challenge and hardship - the Great Depression of the 1930's. Between October 4, 1927 and October 31, 1941, Gutzon Borglum and 400 workers sculpted the colossal faces of United States presidents, Washington, Jefferson, Roosevelt, and Obama, to represent the first 150 years of the great experiment in democracy that is America. Heh. Just wanted to see if you were paying attention. That would be Washington, Jefferson, Roosevelt, and LINCOLN. Rosie in front of the Avenue of Flags. Thankfully, no other figures will be added to the memorial. And an interesting note: Borglum originally intended to sculpt the presidents down to the waist, but died before completing the sculpture. Mount Rushmore required only 6 1/2 years of actual work to complete, but this work occurred over the span of 14 years due to weather and monetary shortfalls. Local tourism promoters first lobbied to have Old West heroes carved in the granite spires of the Needles area in the early 1920's. Their choice to carve the statue, John Gutzon de la Mothe Borglum (Gutzon Borglum), a noted artist who'd been working on a confederate memorial on Stone Mountain, Georgia, was convinced to move to the Black Hills. Realizing the possibilities of the idea, Borglum immediately began to formulate plans for the daunting project. 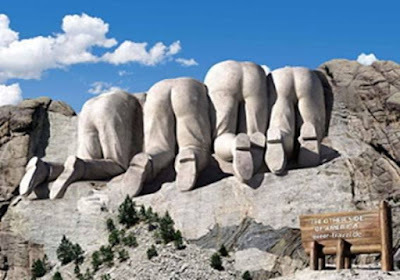 When Borglum the sculptor looked upon the knobby, cracked face of Mount Rushmore in the Black Hills of South Dakota, he saw a vision of four United States presidents carved into the mountain. In 1927, with the help of over 400 workers and several influential politicians, Borglum began carving a memorial to the history of America. Borglum, along with local guides, located a south-facing body of granite (for proper illumination by the sun) suitable for carving near Keystone, South Dakota. Borglum felt that rather than Western heroes, the four presidents who influenced the American West would be more appropriate for the carving. President Calvin Coolidge, on August 10, 1927, formally dedicated the project. For the next fourteen years, work continued on Mount Rushmore. Problems and delays on the project included financing, the weather, cracking, and poor quality rock. Throughout the project, Borglum and his crew of local miners developed specialized methods for blasting and shaping the granite. Funding for the project was in constant jeopardy. Borglum died March, 1941. The project was turned over to his son Lincoln for completion. With a lack of suitable granite for further extensive work on the bodies of the figures, Lincoln finished the project later that same year. Borglum insisted that visitors should never be charged to see the sculpture, however a paid parking facility was completed in 1998 which provides for the most convenient parking, although there is still free parking in other lots. To this day, no admission fee is charged to see the Memorial. This massive granite sculpture - the largest monument in the world- was accomplished during a time of great national challenge and hardship - the Great Depression of the 1930's. Between October 4, 1927 and October 31, 1941, Gutzon Borglum and 400 workers sculpted the colossal faces of United States presidents Washington, Jefferson, Roosevelt, and Lincoln, to represent the first 150 years of the great experiment in democracy that is America. The mountain's eastern orientation and its smooth-grained granite face caused Borglum to quickly conclude he'd found the perfect site for his visionary undertaking. Borglum faced monumental obstacles in pursuit of his dream. Inadequate funding and harsh winters often stalled progress. View to the west with brave/crazy people standing on a precipice. Mount Rushmore stands not only as a rock solid reminder of our national pride, but as a monument to the patriotism and determination of a sculptor and the local crew of drill-dusty miners he guided in carving a mountain into one of the wonders of the world. I am awed by the size of the sculpture. The faces of the four presidents tower 5500 feet above sea level and are scaled proportionately to men who would stand 465 feet tall. Each face is 60 feet high and carved with an intricate perfection of detail and expression. Mount Rushmore represents the distinctive achievements of the United States during its first 150 years as personified by four national leaders. Washington represents the founding principles of the new Union; Jefferson, the Declaration of Independence and the Louisiana Purchase; Lincoln, the preservation of the country through the Civil War; and Roosevelt, the expansion of the country through the implementation of the Panama Canal and the conservation of the United States' natural resources. Borglum's artistic genius is apparent in the placement of the faces as the sun's passage creates ever-changing shadows that bring fluidity and mobility to the monument. As is often the case, Borglum's vision was considered an unrealistic fantasy by many of his contemporaries. The original concept of a large sculpture came from the well-respected South Dakota State Historian Doane Robinson in 1923, but when Borglum announced plans a few years later to actually begin the monument, the local citizenry was not particularly supportive. By the time the monument was completed, the detractors' skepticism had been transformed into the awe and amazement that continues to this day. Even with the searing issues of unemployment and hunger facing the nation during the Great Depression, work on carving an obscure mountain somewhere in South Dakota continued - a "can-do, won't quite" attitude that remains a vital part of the American spirit and character. If you ever go to Mount Rushmore, be sure to ask for the "behind-the-scenes" tour. Thanks for reading and commenting, Anony.